Mystical Rose Bed & Breakfast in Killarney has only six rooms and plenty of hospitality. The Dingle Skellig Hotel in Dingle (on the Dingle Peninsula) is a resort hotel with all the amenities your family could desire. Ross Castle sits just outside Killarney. Killarney is the busiest tourist town in Southwest Ireland- you can shop for all your souvenirs here! Not far from Killarney is Kennedy’s Pet Farm. So many animals to pet and cuddle- plus huge indoor and outdoor play areas! 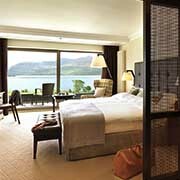 Killarney National Park includes Muckross House, Muckross Abbey and Ross castle in its 25,000 acres. Walking, biking and jaunting cart rides. County Kerry is filled with things to do– the Ring of Kerry, the Dingle Peninsula, the Gap of Dunloe, Crag Cave and more! Planning a visit to Dingle? There are only two roads into the Dingle Peninsula. If you are visiting the Dingle Peninsula be sure to visit Fungi, the famous Dingle Dolphin. Oceanworld Aquarium is a fun stop for kids- especially if they love penguins! Scenic Slea Head Drive on the Dingle Peninsula is postcard picture perfect! Get the 411 on County Kerry – what to do, where to stay and where to eat! Arrival Guides has a free, downloadable guide for Killarney. Faeries are thick in County Kerry! Have fun finding faerie coins! Tips for staying in Killarney: laundry, dining & jaunting carts! A 10 Day Ring of Kerry Itinerary filled with fun ideas & tips! Here’s what to do on the Dingle Peninsula in 2 days. Think all Irish cuisine is pub food? Get your fill of fresh at Avoca cafe in Moll’s Gap on the Ring of Kerry. Follow Ireland Family Vacations’s board County Kerry, Ireland on Pinterest.